Wait, what’s that I hear you cry? There’s no such thing as old Superman and new Superman? They’re ostensibly the same character, Kal-El/Clark Kent? How is this even happening? I’ll tell you why. COMIC BOOKS, THAT’S WHY. So, a recap if you’re unfamiliar with the wild, wild situation in the current DC Comics universe. A long time ago in a galaxy far far away In 2011, DC rebooted its entire comic universe: the multiverse was gone, and in its place a new world populated by younger versions of the company’s most iconic heroes, newly awakened to many of their powers and callings. A fresh start for legendary characters like Superman—a Superman who, let’s be honest, has had one hell of a rough six months. His powers have been scaled back. His identity revealed. His pseudonym replaced. Hell, his best friend may have just bitten the bullet too. Superman’s having it really, really rough. But he doesn’t know that there’s another Superman tooling around his Earth just yet. Born out of DC’s Convergence event, which also brought back the Multiverse (because Comic Books), this Superman is in fact the Superman people have known and loved for decades: the one before the events of Flashpoint that created the “New 52” universe, the one married to Lois Lane and with a son. The one who’s appeared in pages and pages of comics since Crisis on Infinite Earths and beyond. Following a surprise return in a miniseries for Convergence, this Superman returned to the current DC universe in a recent series called Superman: Lois and Clarke, and decided to hide himself away from his new, younger self while secretly trying to prevent some of his greatest enemies from existing in the first place. Extremely convoluted? Yes. Comic booooooooooks. Also? He has a sick beard and runs around in a black, capeless supersuit. But now, according to DC’s new solicitations for March 2016—teasing the upcoming slate of titles they’ll publish that month—Superman #50 will not only see the current Superman back fully restored to power and back in his supersuit (rather than his rather silly buzzcut-and-tee look), but also see him encounter this other Superman. The classic Superman. Whatever will they do? We have no idea outside of the limited information in the solicitation. But presumably, it will be sweeping and epic and wonderful and the epitome of all crossover encounters. Or it’ll be convoluted fun, like many superhero comics. We’ll find out in March! Maybe they’ll compare beard notes. Superman should grow a beard. 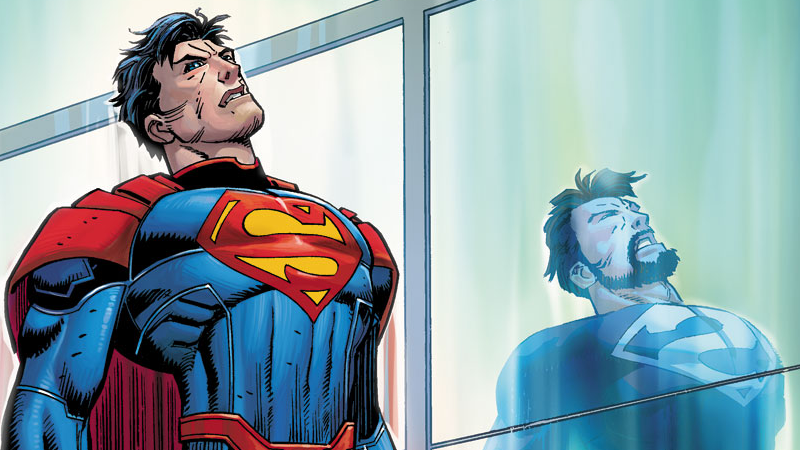 What Is the Deal With Superman In DC Comics&apos; Rebirth?